The Early Childhood Policy Summit at UM-Flint focused on "a better future for Michigan’s children." 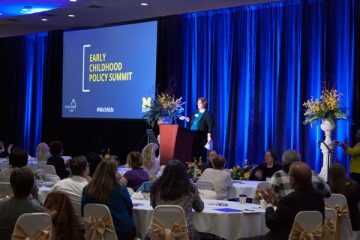 The University of Michigan-Flint hosted the inaugural 2018 Michigan Early Childhood Policy Summit April 9. The summit brought together over 200 attendees, including elected officials, education experts, and other leaders in various fields, to explore possibilities for short- and long-term goals for early childhood care and education in the state of Michigan. 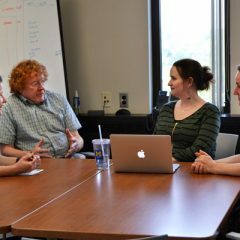 An aim of the summit was to help facilitate the creation of a statewide Early Childhood Policy Plan. The event drew leaders from business, health fields, education, politics, other fields, and community members from throughout Michigan. Mary Jo Finney, PhD, moderates the panel “A State of Crisis: Exploring solutions to counter systemic inequity,” with Dr. Mona Hanna-Attisha, Lenwood Hayman, PhD, and Dr. Iheoma Ikura. 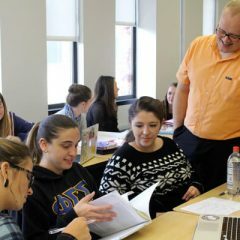 The summit tackled a series of issues, such as public-private partnerships, how investing in early childhood education makes good business sense, and how responsive caregiving supports the social and emotional development of students. 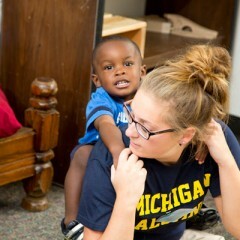 Amy Hesse is the Central Administrator of Cummings Great Expectations Early Learning Center in Flint, of which the University of Michigan-Flint is a partner. She helped organize the summit. 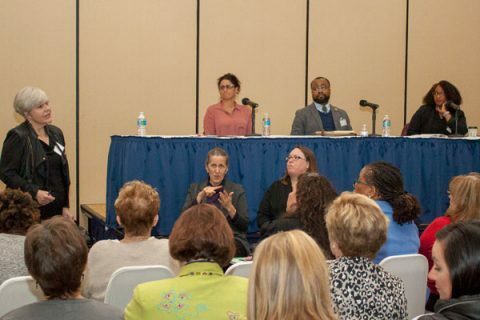 The featured speakers at the summit included Judy Reidt-Parker of The Ounce of Prevention Fund; Matt Gillard, president and CEO of Michigan’s Children, a statewide advocacy organization; and Carolyn Joy Dayton of Wayne State University’s School of Social Work and the Merrill Palmer Skillman Institute. Barnett is hopeful that the summit and similar initiatives will allow parents like DeVille and educators like Smith to extend the reach and impact of their efforts to advance early childhood education and related issues.